The Bounds of Sense: An Essay on Kant’s Critique of Pure Reason is a 1966 book about Immanuel Kant's Critique of Pure Reason (1781) by the Oxford philosopher Peter Strawson, in which the author tries to separate what remains valuable in Kant's work from Kant's transcendental idealism, which he rejects. The work is widely admired, and has received praise from philosophers as an important discussion of the Critique of Pure Reason, although Strawson's treatment of transcendental idealism has been criticized. According to Strawson, the book originated in lectures on the Critique of Pure Reason he began giving in 1959 at the University of Oxford. 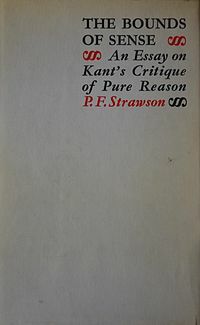 Strawson provides a critical reading of Kant's text (referring to parts of it as proceeding "by a non sequitur of numbing grossness"), with an emphasis on the analytical argument of the transcendental deduction, which he considers one of the few lasting contributions Kant made to philosophy. His title is a play on a title Kant himself proposed for the Critique of Pure Reason, with "sense" referring both to the mind and the sense faculties, and hence the bounds can be either those of reason or sensation. The Bounds of Sense was first published in 1966 by Methuen & Co. Ltd. It was reprinted in 1968, 1973, and 1975. The work has also been published in Spanish, German, Italian, and Japanese translations. In 2016, The Bounds of Sense was discussed in the European Journal of Philosophy by Lucy Allais, Henry Allison, Quassim Cassam, and Anil Gomes. Allais expressed disagreement with Strawson's interpretation of transcendental idealism. Allison also criticized the work, while Cassam wrote that, "The realism that is implicit in The Bounds of Sense is much more explicit in Strawson's later work but relies on problematic assumptions about the relationship between epistemology and metaphysics." Gomes criticized Strawson's argument that unity of consciousness requires experience of an objective world. However, he credited Strawson with raising the important question of whether "there ways in which we must think of our experiences if we are to self-ascribe them". The Bounds of Sense has been praised by the philosophers John McDowell, in Mind and World (1996), Charles Parsons, in The Cambridge Companion to Kant (1998), Roger Scruton, who identifies the book as one of the most important recent commentaries on the Critique of Pure Reason in A Short History of Modern Philosophy (2002), and Howard Caygill, who calls it a distinguished reading of the Critique of Pure Reason in his introduction to the book. More critical views include those of philosophers such as Thomas Baldwin, Frederick C. Beiser, and E. J. Lowe. Baldwin writes in The Cambridge Dictionary of Philosophy (1999) that Strawson's critics have argued that Strawson's attempt to separate Kant's conclusions "concerning the presuppositions of objective experience and judgment" from his transcendental idealism leads to an unstable position. In the view of these critics, transcendental arguments "can tell us only what we must suppose to be the case", meaning that "if Kant's idealism, which restricts such suppositions to things as they appear to us, is abandoned, we can draw conclusions concerning the way the world itself must be only if we add the verificationist thesis that ability to make sense of such suppositions requires ability to verify them." Beiser writes in German Idealism: The Struggle against Subjectivism, 1781-1801 that while Strawson is the most notable commentator to have argued that the central arguments of Kant's Analytic can be separated from Kant's transcendental psychology and transcendental idealism, Strawson's interpretation of the Deduction leaves numerous unresolved questions. He notes that Kant himself rejected a reading of the kind proposed by Strawson. Lowe writes in The Oxford Companion to Philosophy (2005) that while The Bounds of Sense is widely admired, Strawson is "seen by some as being unduly dismissive of Kant's doctrine of transcendental idealism" and over-optimistic in his "suggestion that many of the central arguments of Kant's critical philosophy can survive" its repudiation. ^ Strawson 1975, p. 11. ^ Strawson 1975, p. 137. ^ Strawson 1975, p. 6. ^ a b Allais 2016, pp. 892–906. ^ a b Allison 2016, pp. 920–933. ^ a b Cassam 2016, pp. 907–919. ^ a b Gomes 2016, pp. 946–969. ^ McDowell 1996, p. viii. ^ Parsons 1998, p. 83. ^ Scruton 2002, p. 303. ^ Caygill 2007, p. xxii. ^ a b Baldwin 1999, p. 882. ^ a b Beiser 2002, pp. 177–178. ^ a b Lowe 2005, p. 898. Beiser, Frederick C. (2002). German Idealism: The Struggle against Subjectivism, 1781-1801. Cambridge, Massachusetts: Harvard University Press. ISBN 0-674-00769-7. Caygill, Howard; Kant, Immanuel (2007). Critique of Pure Reason. New York: Palgrave Macmillan. ISBN 978-0-230-01338-4. McDowell, John (1996). Mind and World. Cambridge, Massachusetts: Harvard University Press. ISBN 9780674576100. Scruton, Roger (2002). A Short History of Modern Philosophy. London: Routledge. ISBN 0-415-26763-3. Strawson, Peter (1975). The Bounds of Sense. London: Methuen & Co Ltd. ISBN 0-416-83560-0.